Future Stock Prices Depend on Earnings. As an investor in stocks, you should always be asking what the company will do for me tomorrow. By that, I mean investors are particularly concerned with future growth in earnings and, ultimately, the stock’s price and dividend if it pays one. A company can have a great year and the stock can reflect that performance, but if there is no brighter tomorrow, how is future stock price growth going to be justified? This concern with short-term growth is often criticized as a problem that penalizes companies that make decisions good for the long term, but detrimental in the near term to earnings. That’s not always the case if management is trusted by investors to make good decisions, however in many cases companies’ stock is hammered in the market if there is not a clear pattern of year-to-year growth.This is especially true of companies tagged as growth investments and in sectors such as technology that are marked by high growth rates. While this may seem unfair to some, it is a perfectly logical way for the market to allocate investment assets to those stocks that will produce the highest returns in the near future.Individual investors are rightly cautioned to invest for the long term and many successful investors do just that, however they only do so when they find a company that has a good chance of providing a sustained growth over a long period. Investing in company for the long term that does not grow is a pointless exercise (unless you are investing in a utility, for example, for a nice fat dividend and don’t care much about the share price). 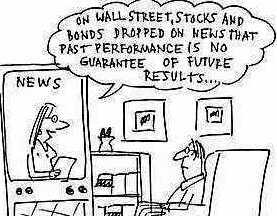 The message is stock investors should always looking forward and should not be concerned with past performance other than in providing a reference point for judging performance. This is one the reasons why it’s good to invest in people (CEOs). If they’ve got a great track record, chances are they’ll do well again. Warren Buffet could start a lemonade stand and people would invest millions in it in a heartbeat. I’m with you when it comes to the importance of leadership. The CEO is key. I am, however, a the-times-make-the-man kind of guy rather than the other way around. Even guys like Jack Welch soared then stalled when the market evolved away from them. When the right leader meets the right business model then magic happens. But Berkshire Hathaway’s success notwithstanding, unless that lemonade stand was in good shape I wouldn’t throw my money behind Buffet making it a success. Chris, the right leader + the right opportunity is always the best formula. But a successful track record is worth a lot of confidence. And in the end, all you’re really selling is confidence in future profitability. The Buffet lemonade stand might not make it past week one. But as long as you’re in by day 2, you’re gonna make some money. Thanks for your visit and comments guys. Now we are reaching somewhere, right leader + right opportunity + a successful track record is a perfect combination. And as far as the lemonade, I feel confident that if I get in at the right time, I will make money. Basically it bottles down to the fact that individuals have different kinds of attitude to investments.